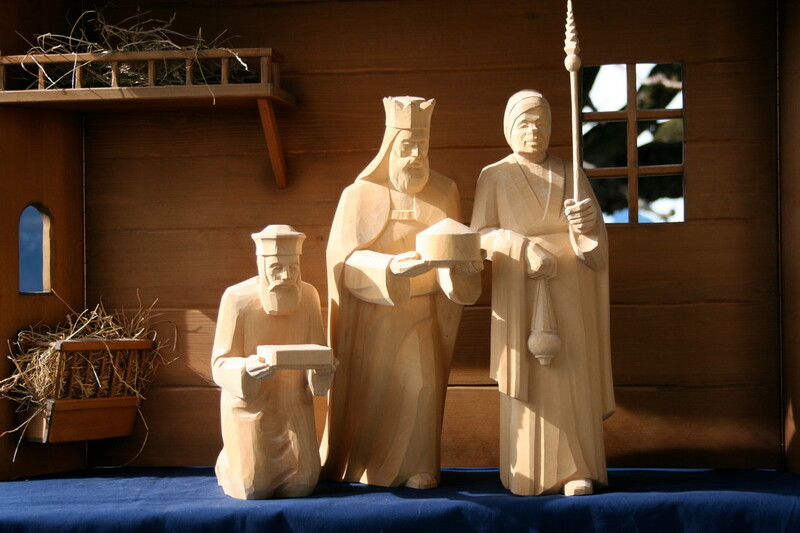 more than 80 years ago, hans huggler-wyss created the first handcarved nativity scne of switzerland at the time: christnacht 14 cm. 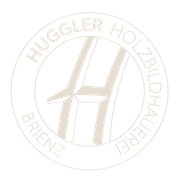 though the years the creative carvers of huggler disigned more different scenes. 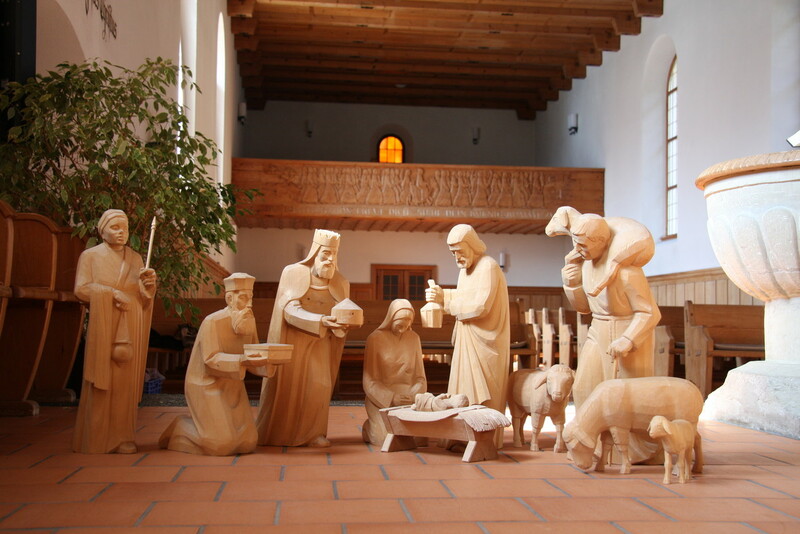 all these are still carved after the original models and are suplemented every year by new figures. 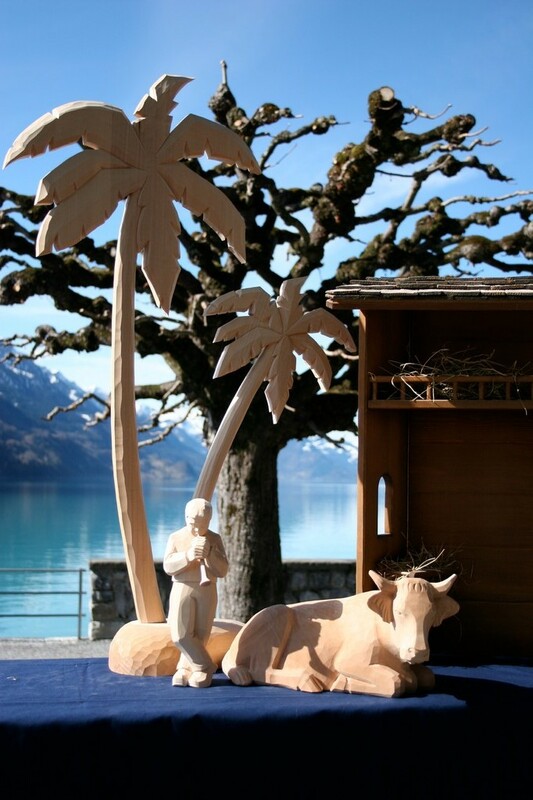 The manger "Palestine" was designed in 1977 and is the smalles of the typical Christmas mangers of Brienz. 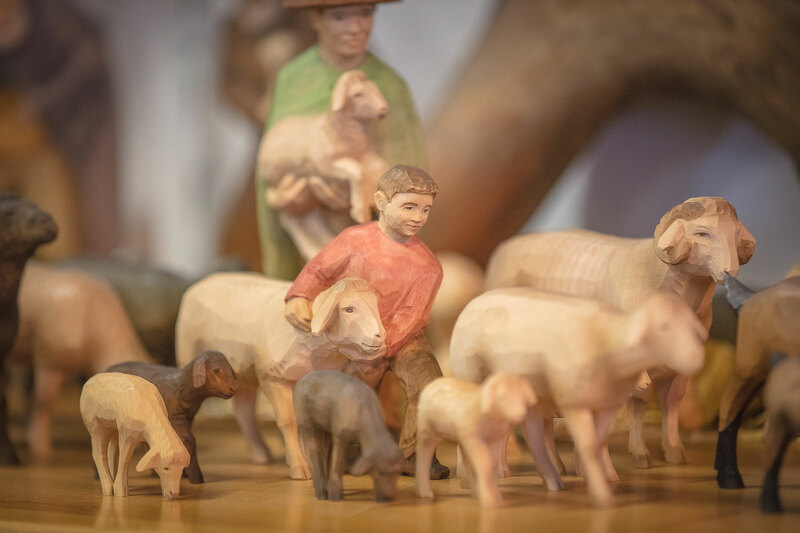 These delicate figures are carved and painted by hand with much attention to detail. 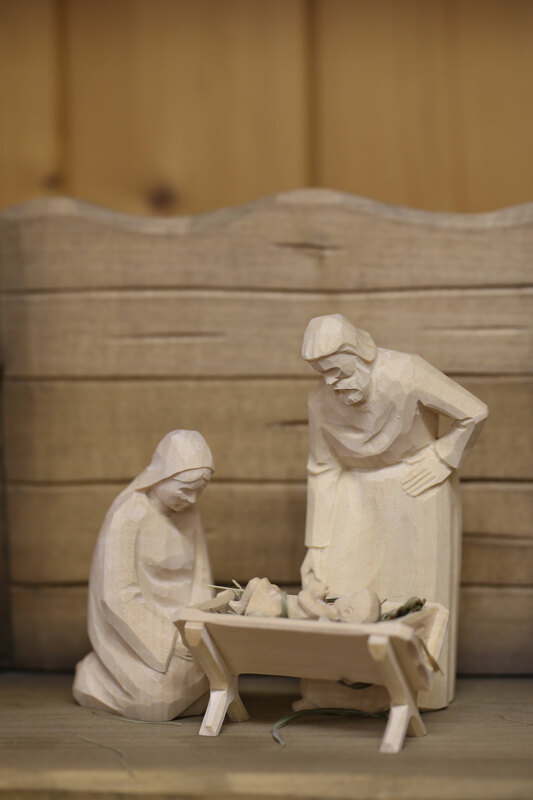 The nativity set "Christnacht" was the first handcarved Christmas manger to be designed by Hans Huggler-Wyss in 1915. 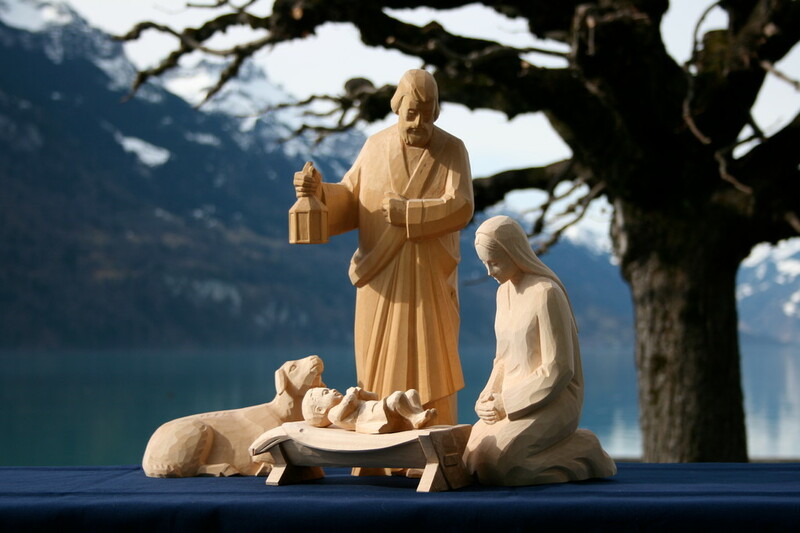 As in those days, it is still carved and painted by hand with much attention to detail in the typical flat cut. 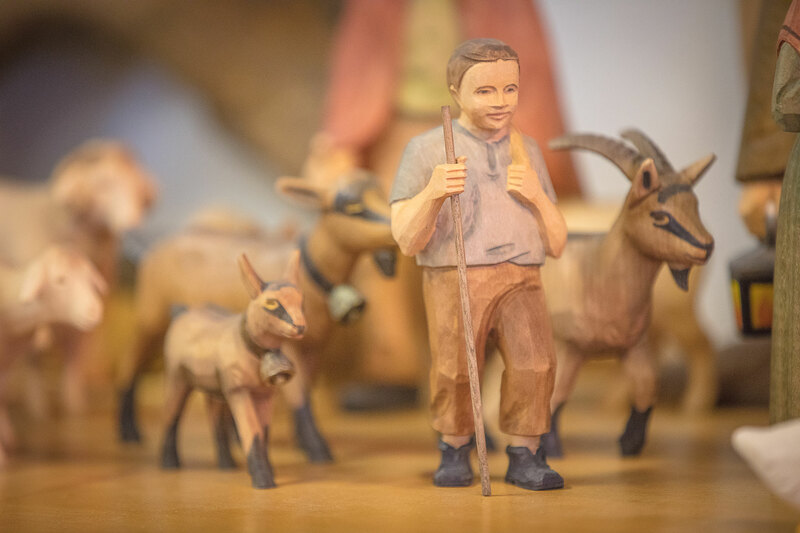 Protecting the shepherd suits children's figures wonderfully. 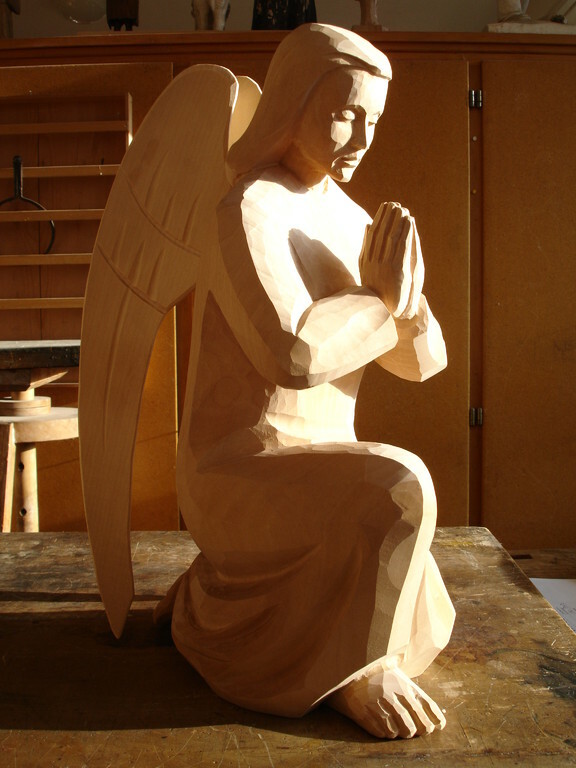 He was designed by Sylvia Hilpertshauser. 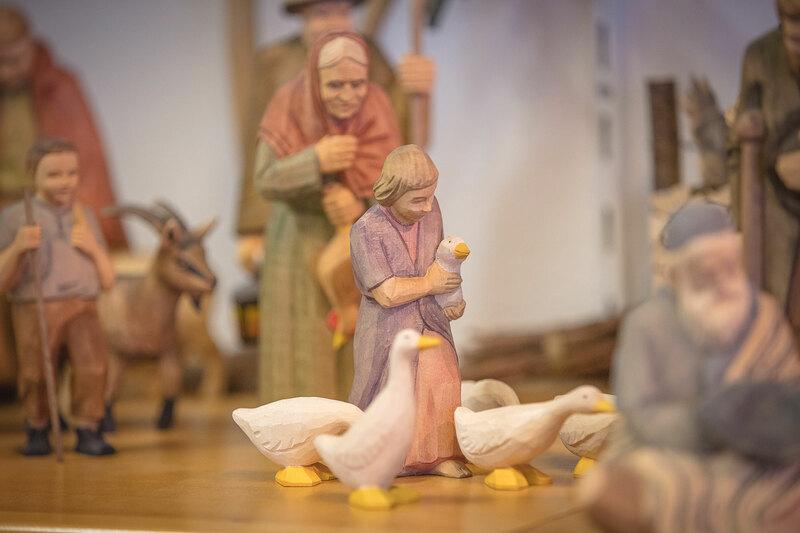 A new kind of figurines which fits wonderfully into our crib. 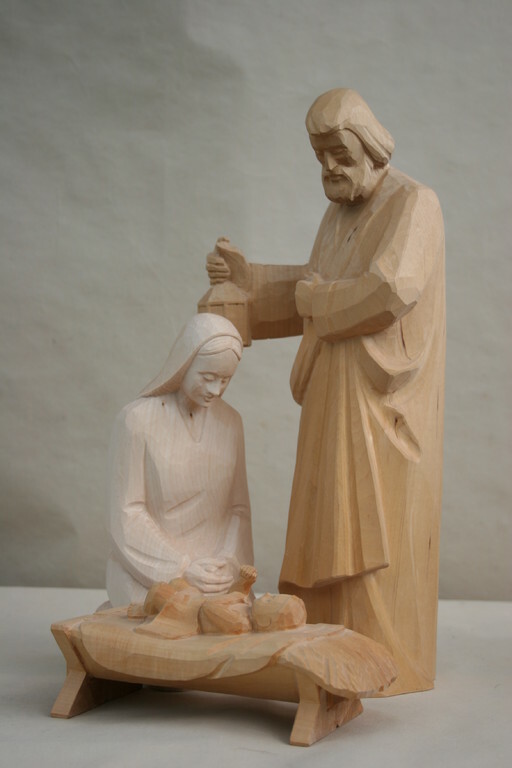 Whether he explains to the child what is happening here .. or he simply enjoys it with his child .. 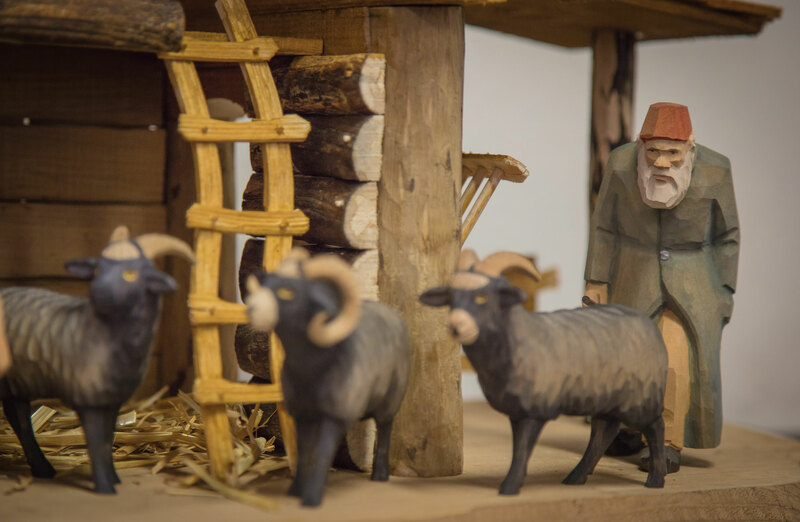 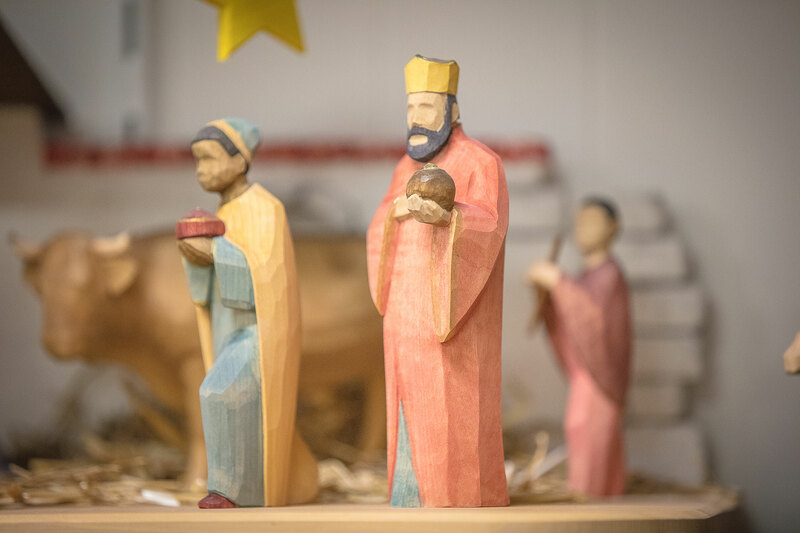 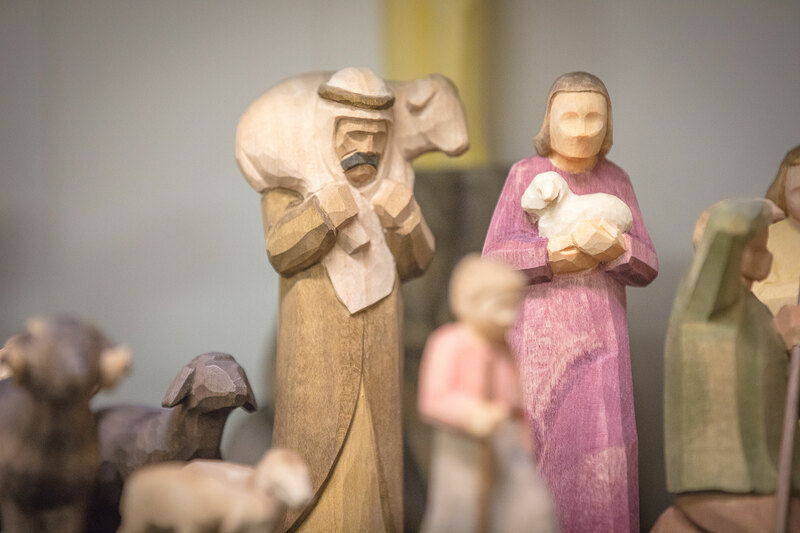 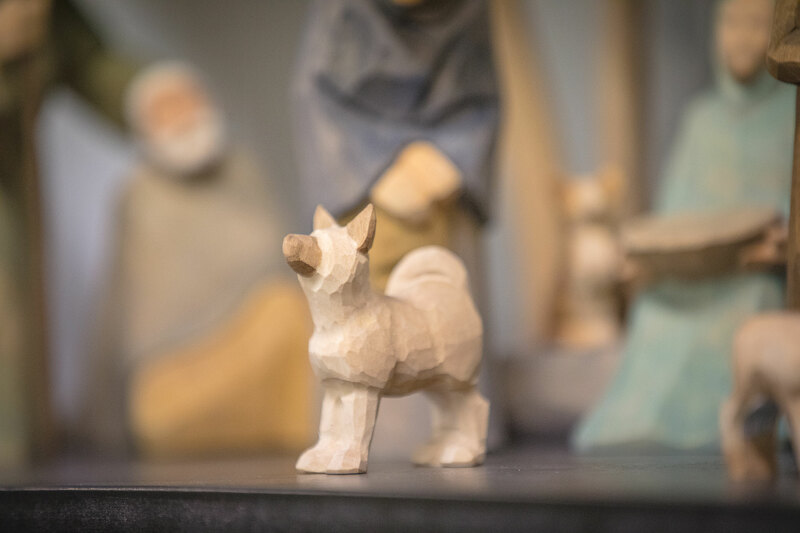 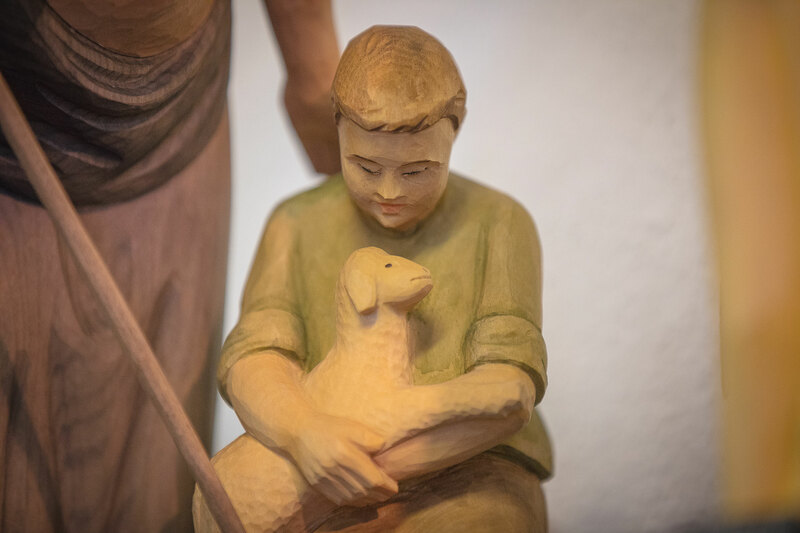 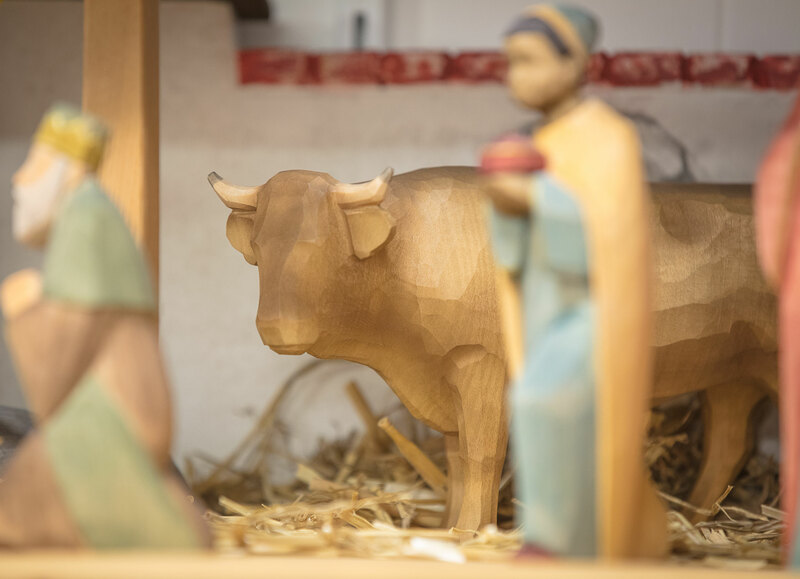 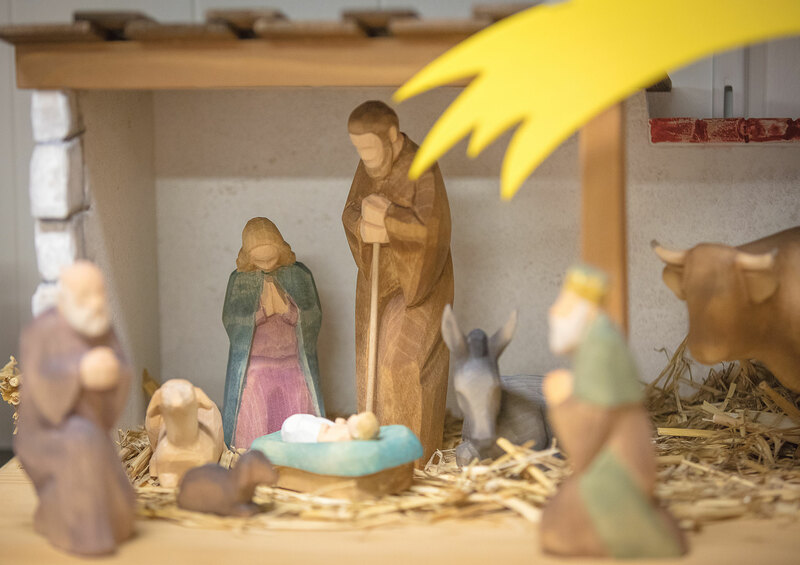 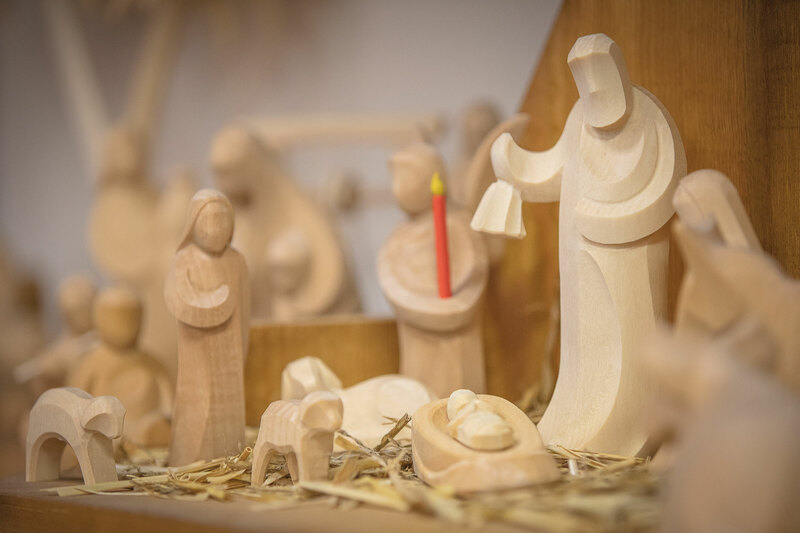 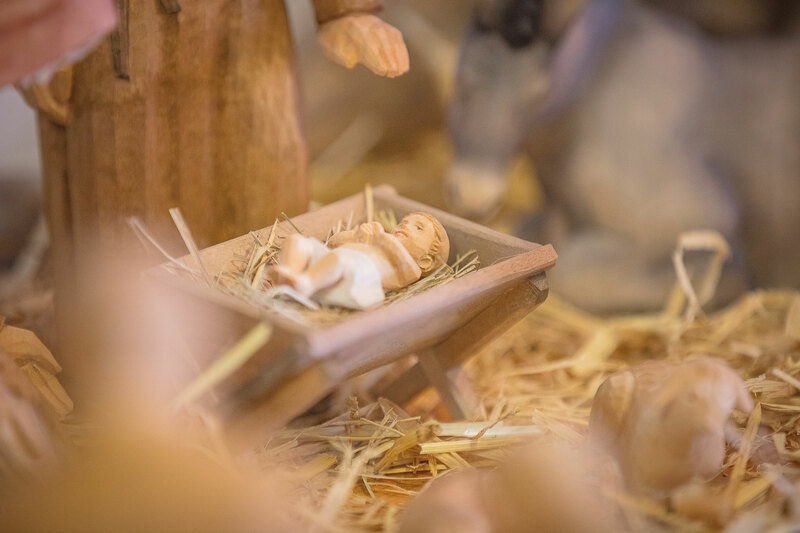 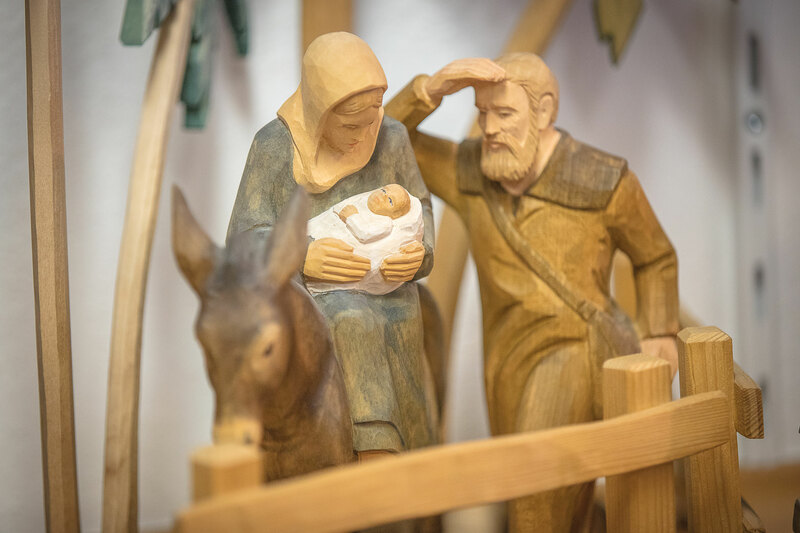 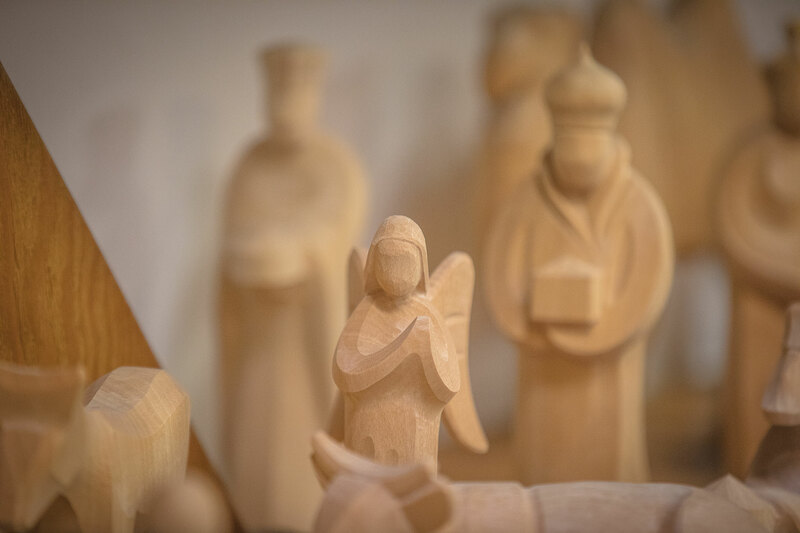 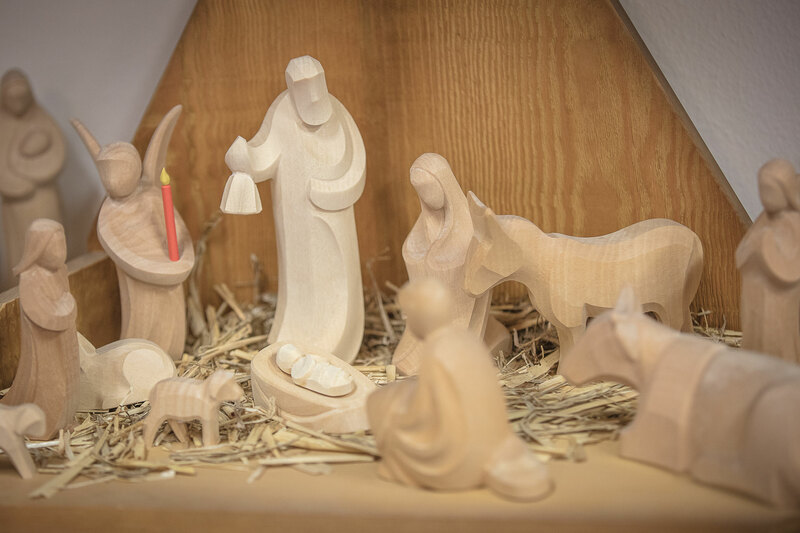 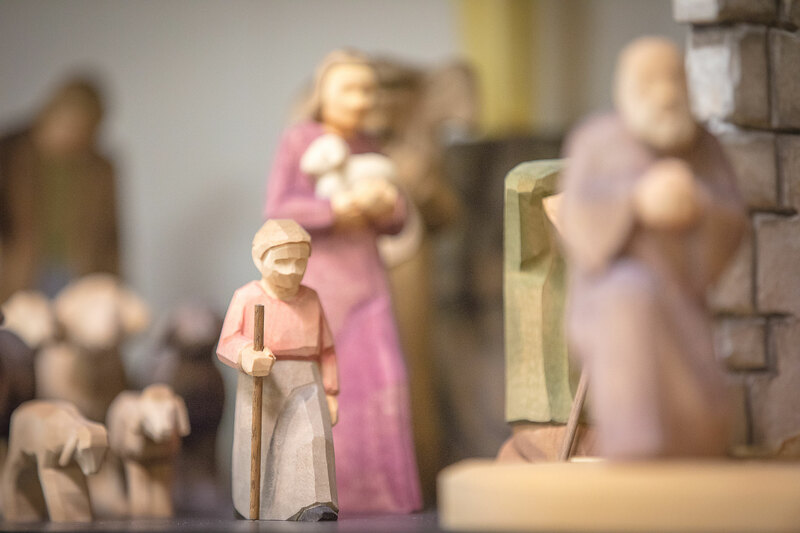 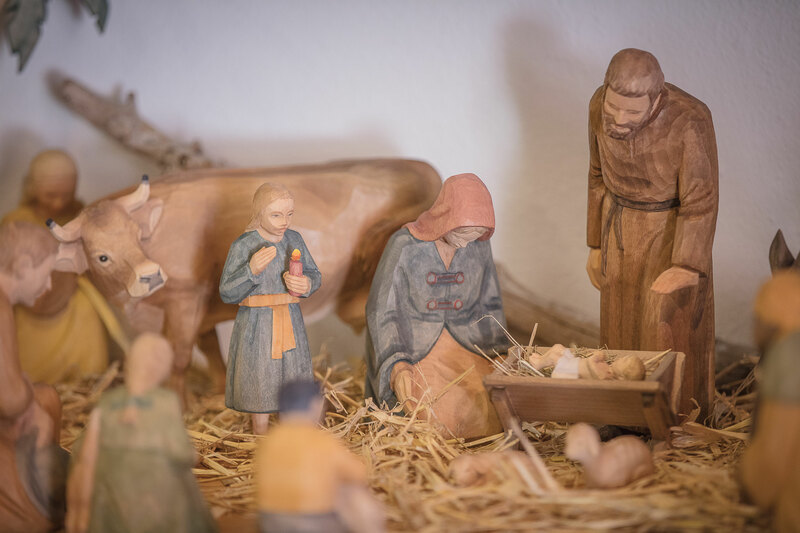 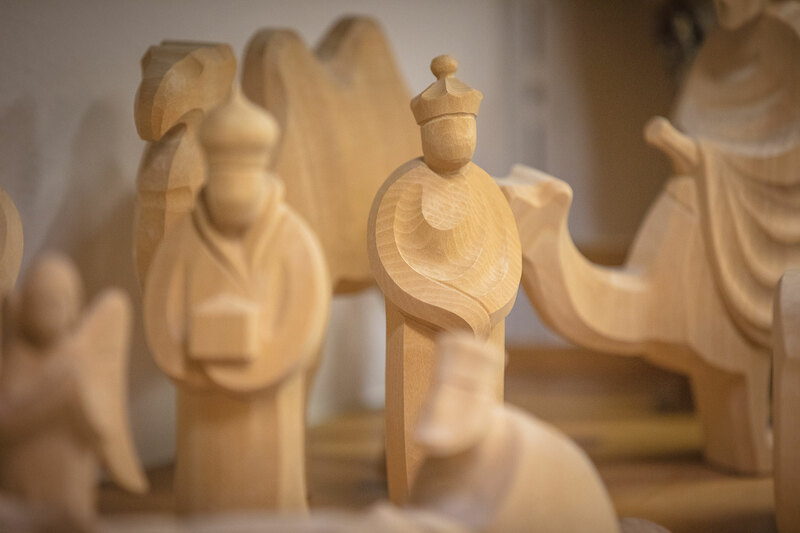 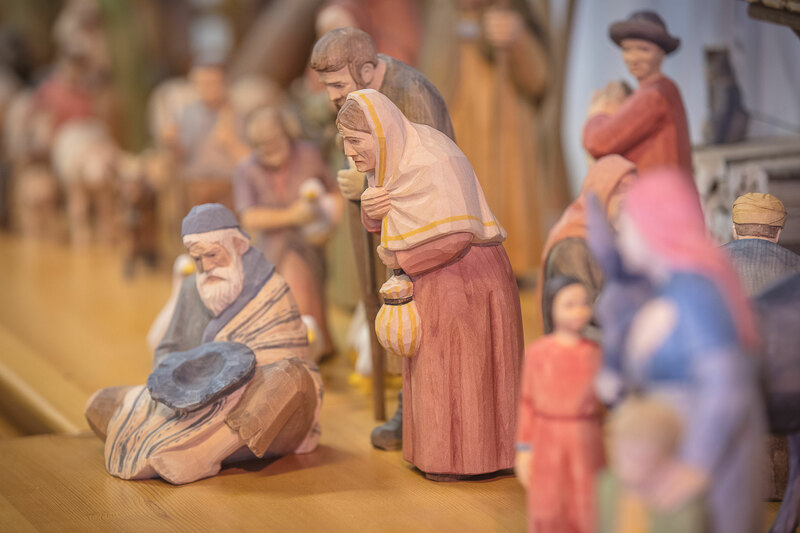 The manger "Weihnacht" has been the classical in our woodcarving centre since 1925. 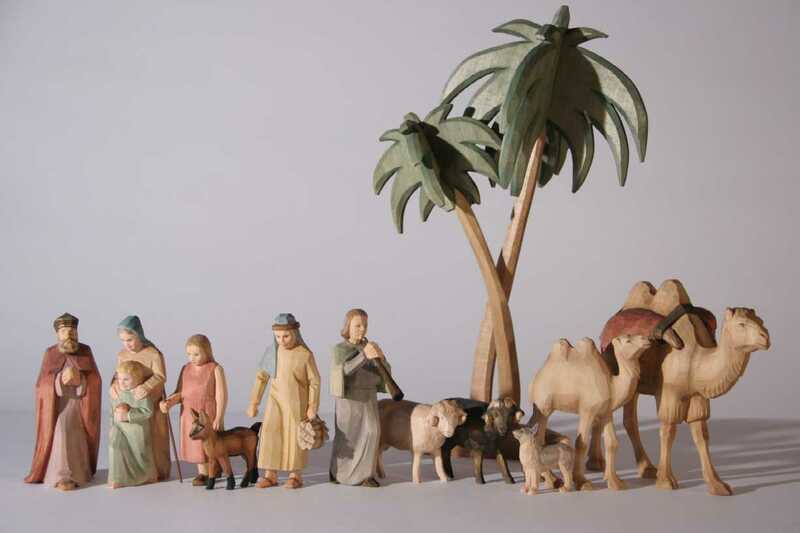 At the height of 22 cm, the large and expressive figures are convincing because of the detailed workmanship. 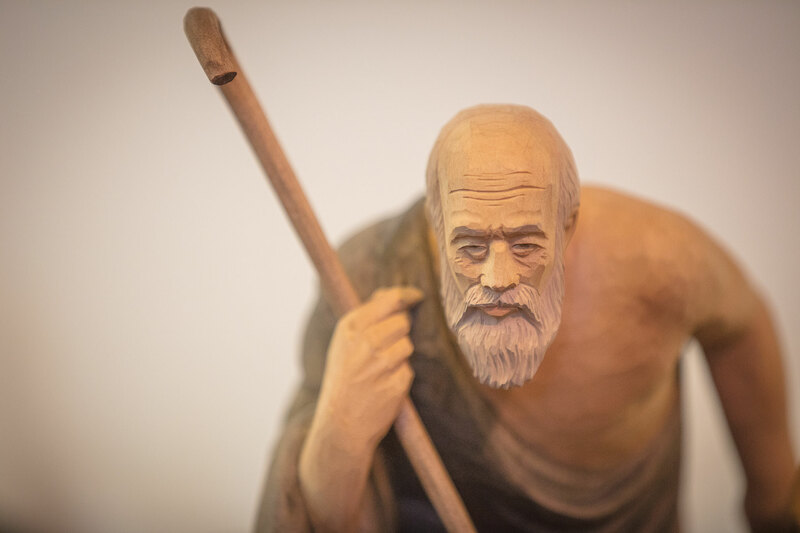 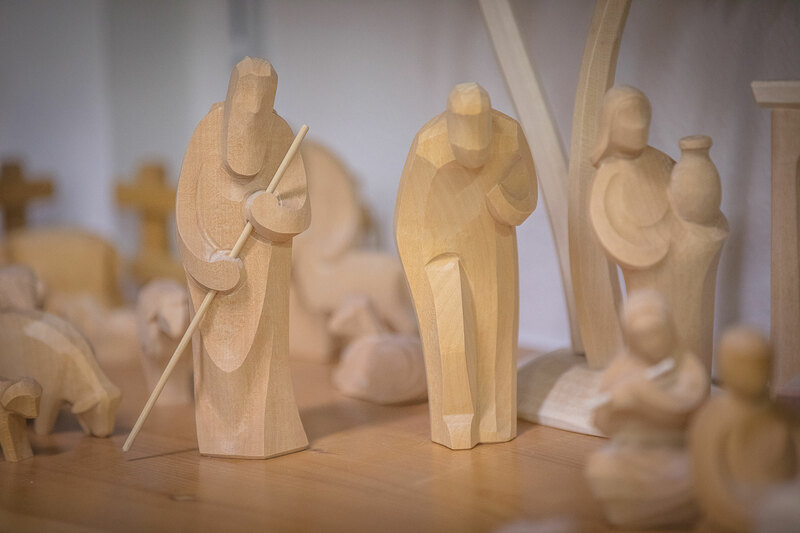 At the time, in developping the figures, our woodcarvers were inspired by the character traits of village "originals". 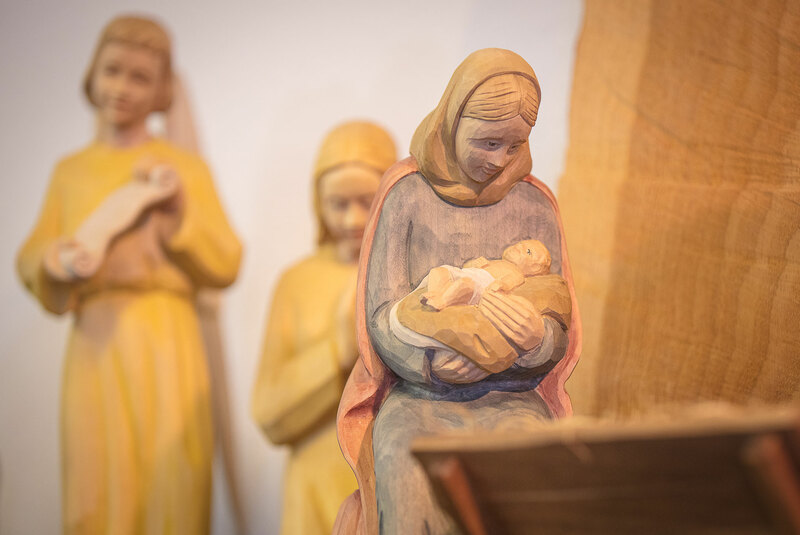 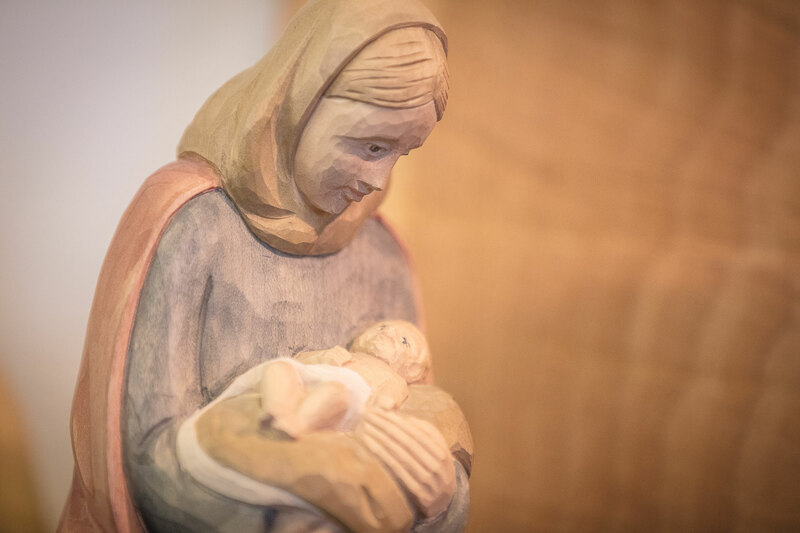 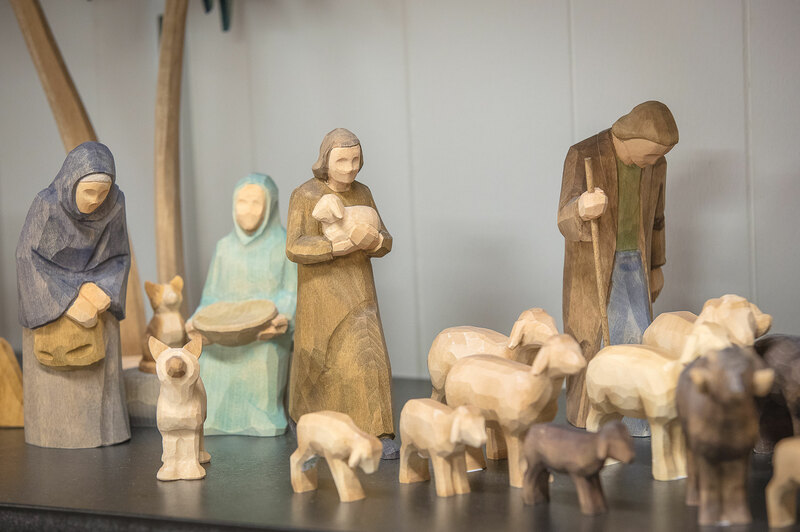 The manger "Noel" was designed in our woodcarving center in 1965. 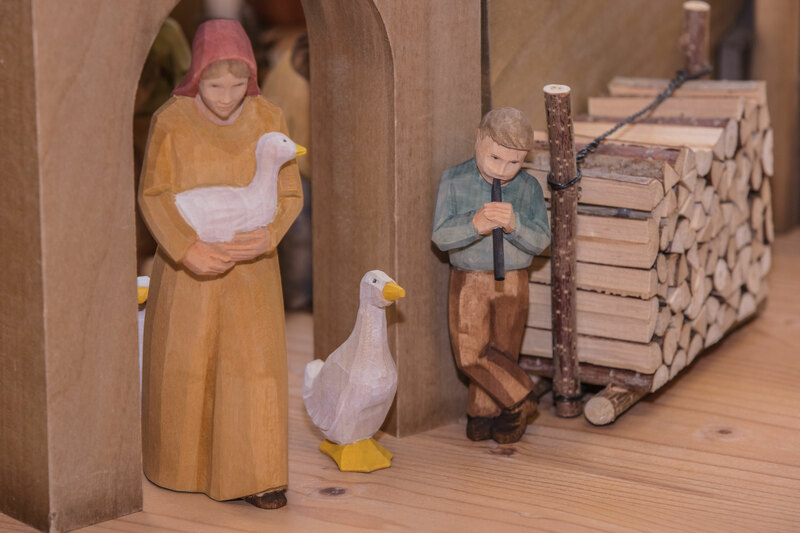 The figures, reduced tho the essentials in the typical flat-cut techniqe, look very festive and modern. 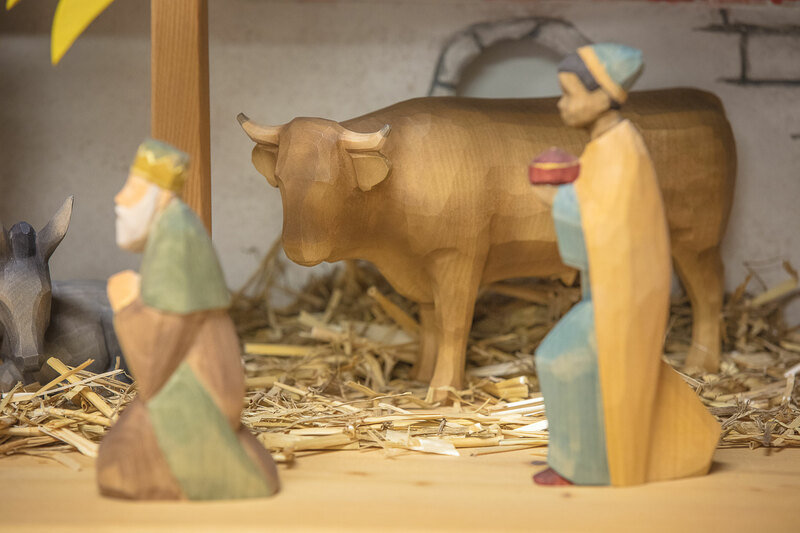 By candlelight the style of this manger is especially advantageous. 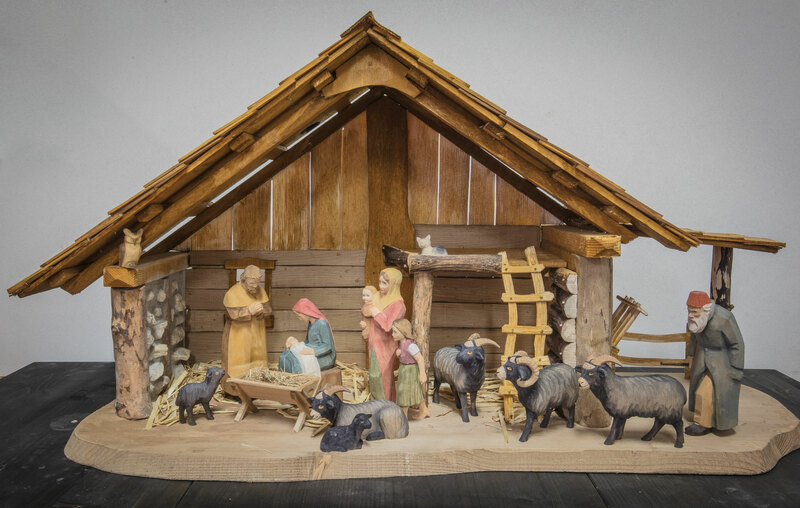 The manger "Christmas" was designed in 1970 and because of ist size, it is considered to be one of the most impressive and beautiful Swiss Christmas mangers. 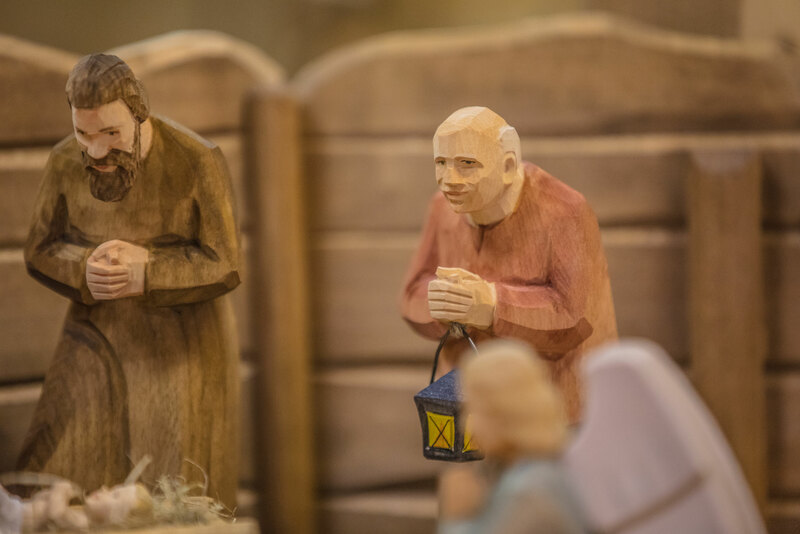 The characteristic facial traits of the human figures are a main Feature of These manger figures. 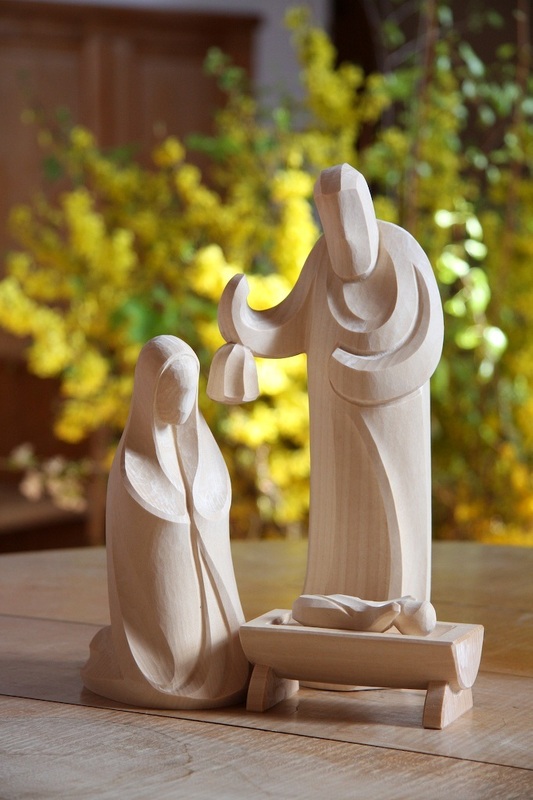 The manger "Candlelight" was designed in 1992 and ist the latest of the mangers made by Huggler. 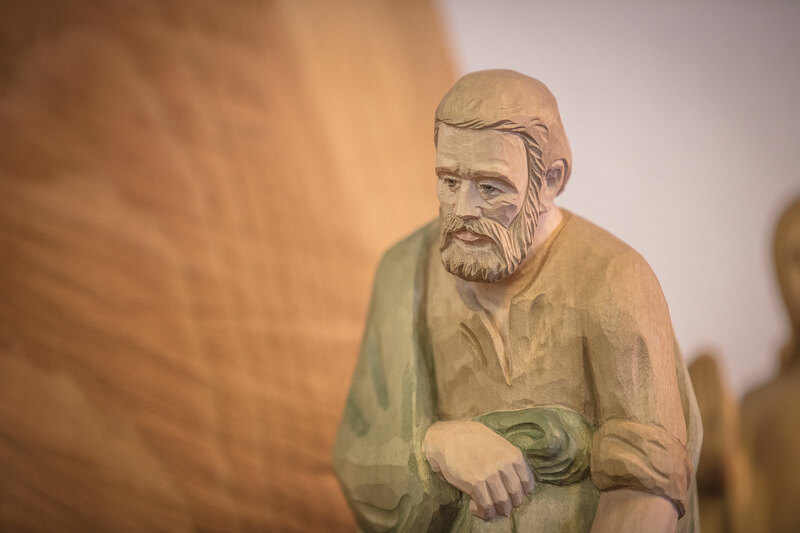 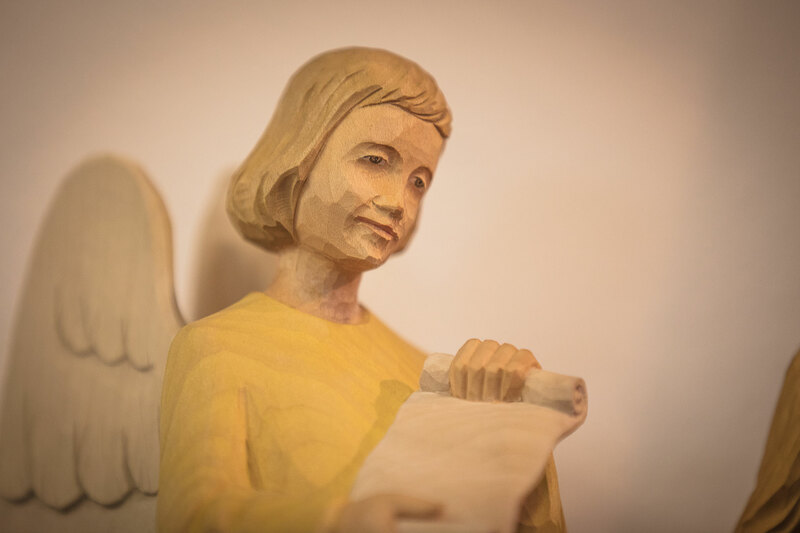 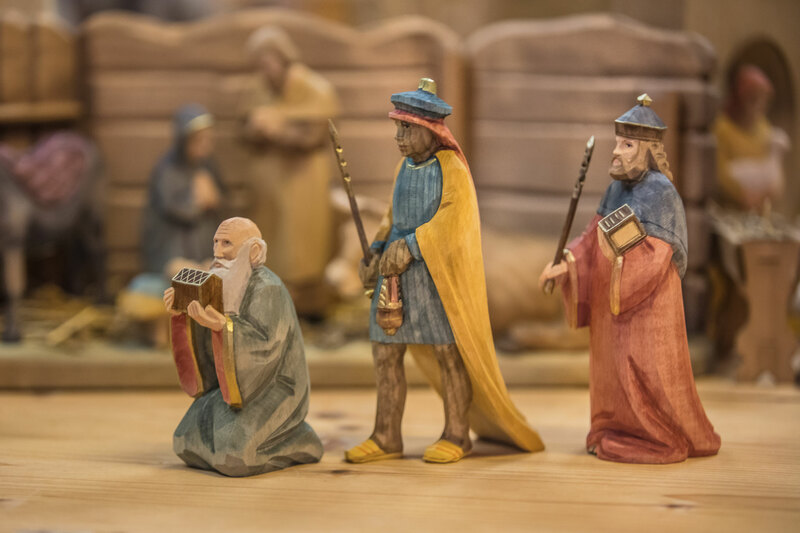 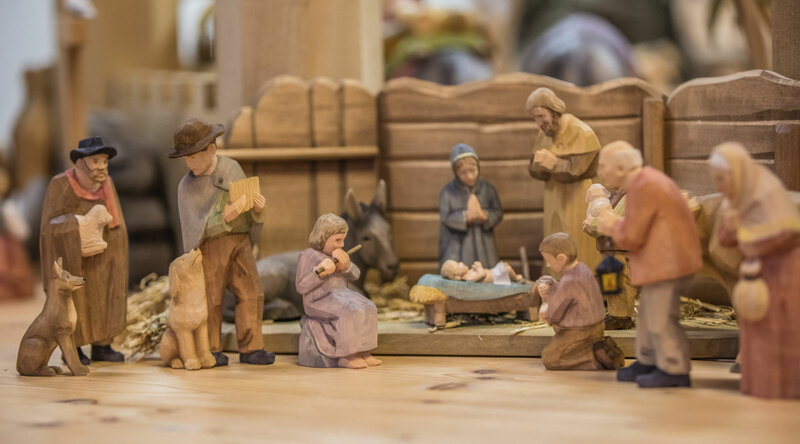 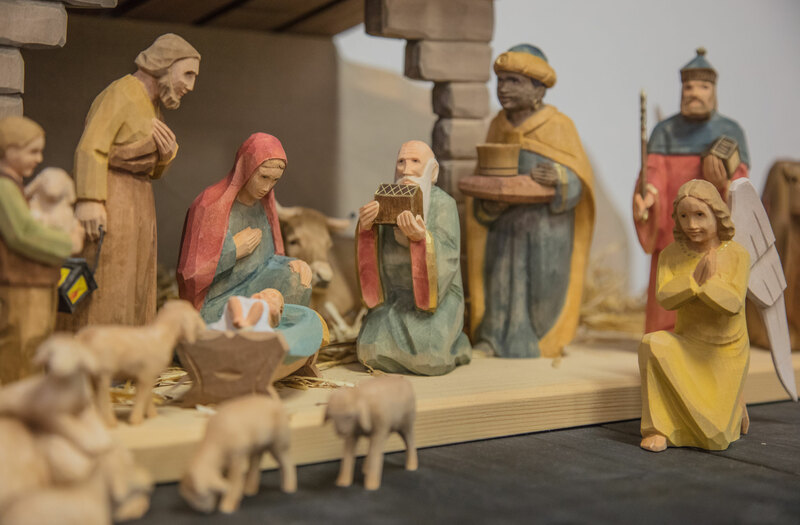 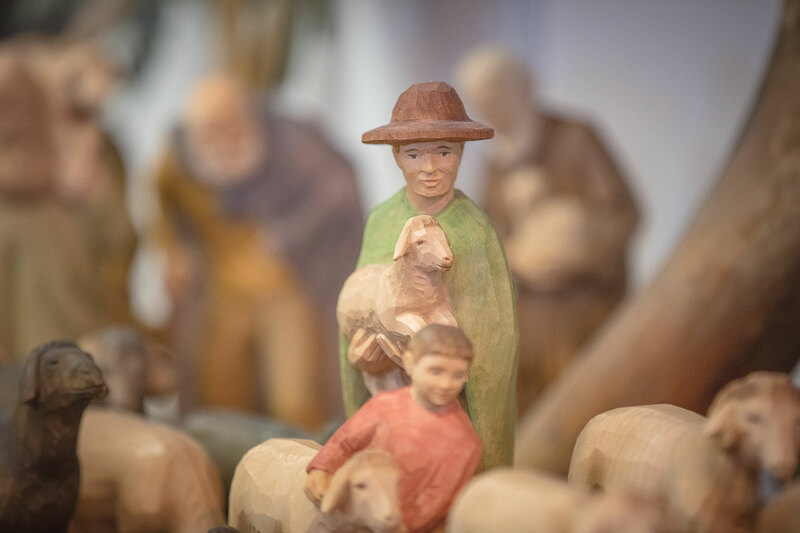 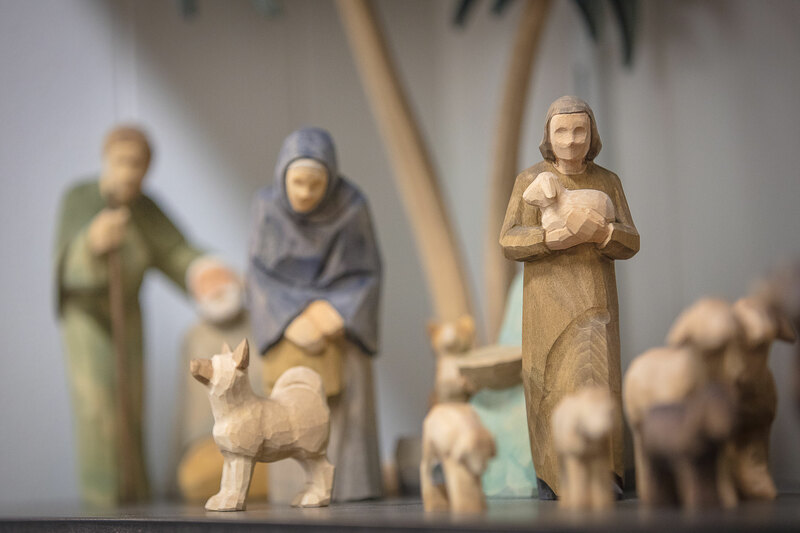 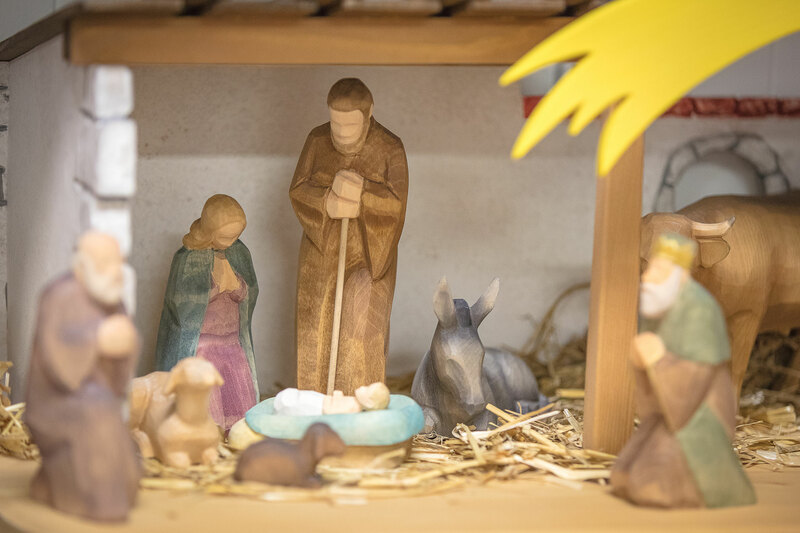 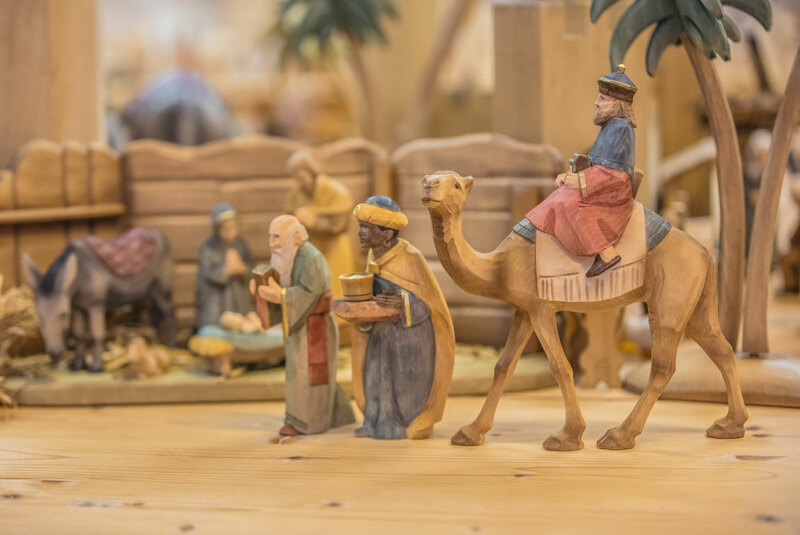 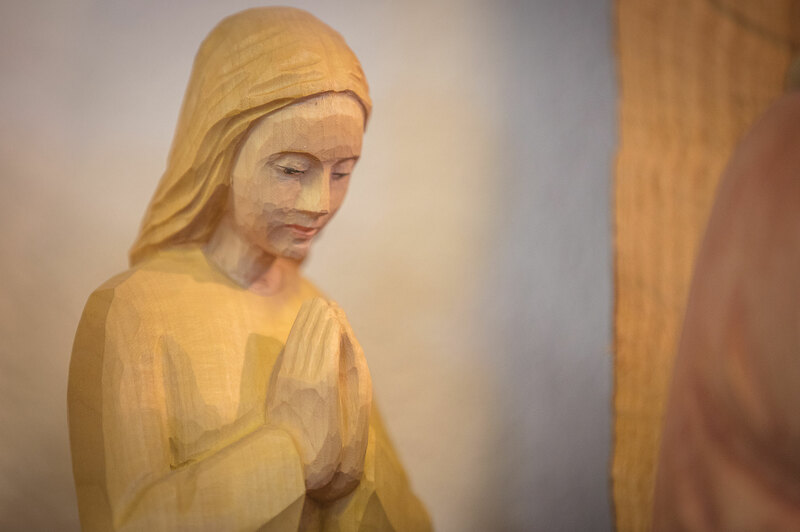 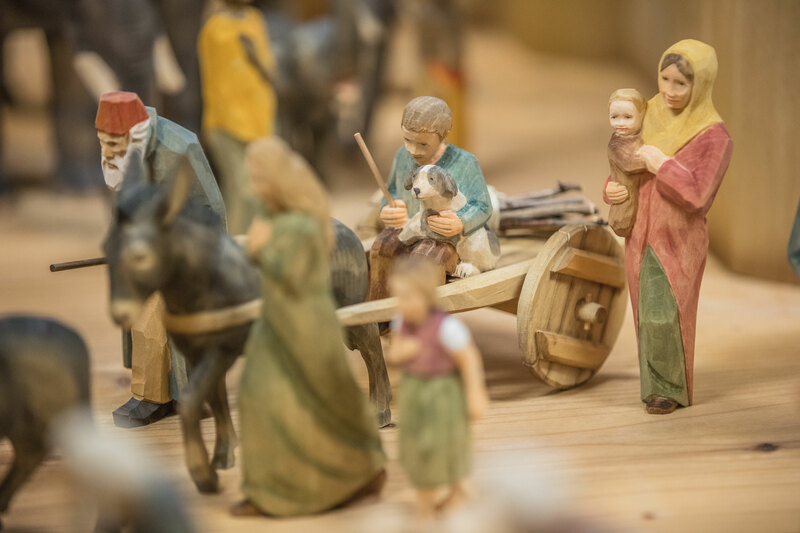 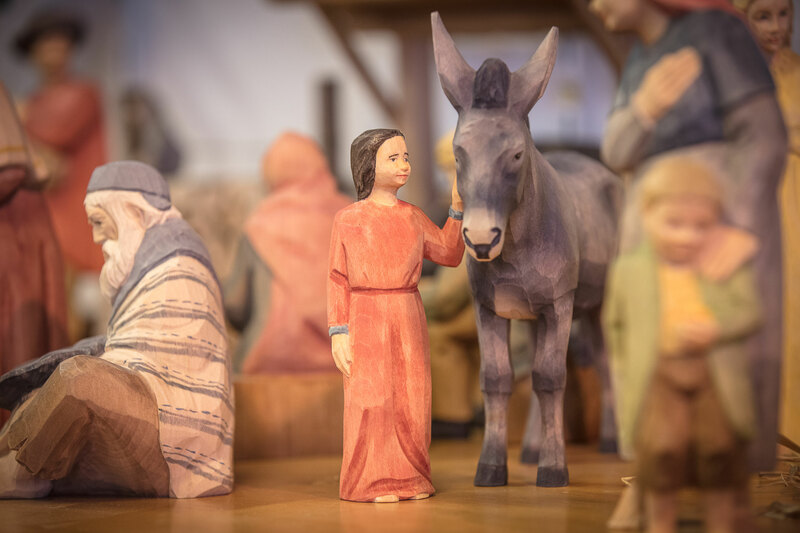 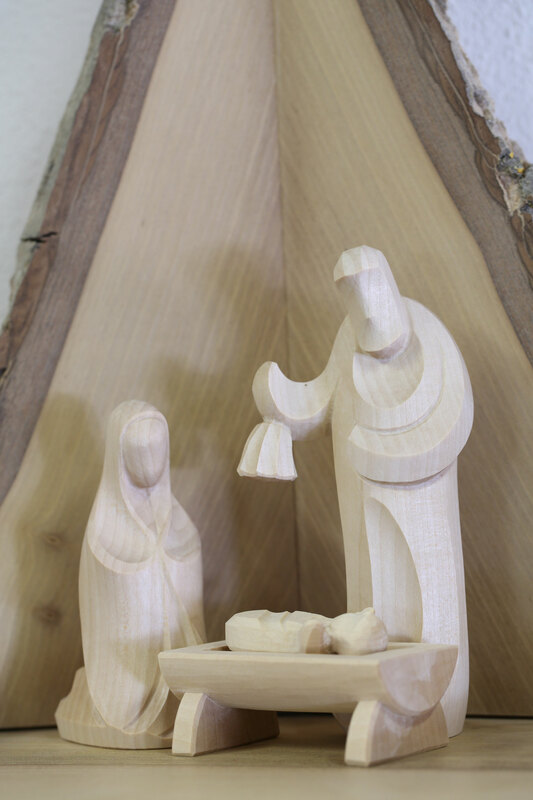 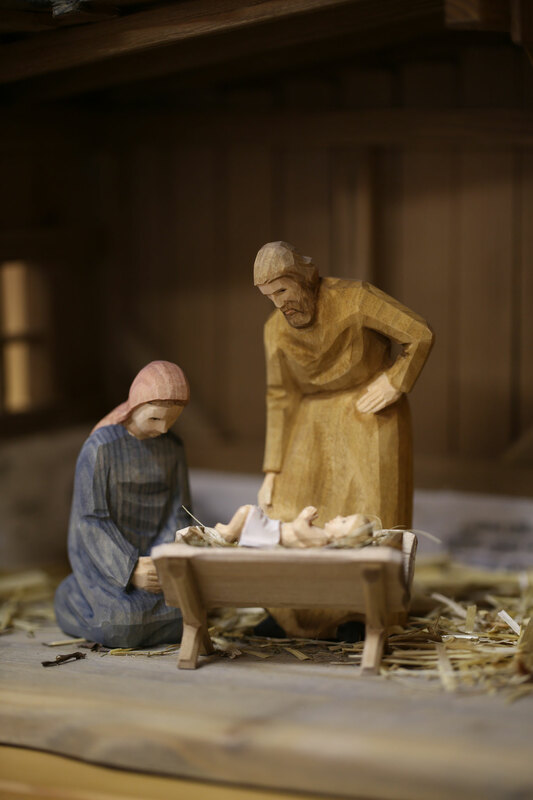 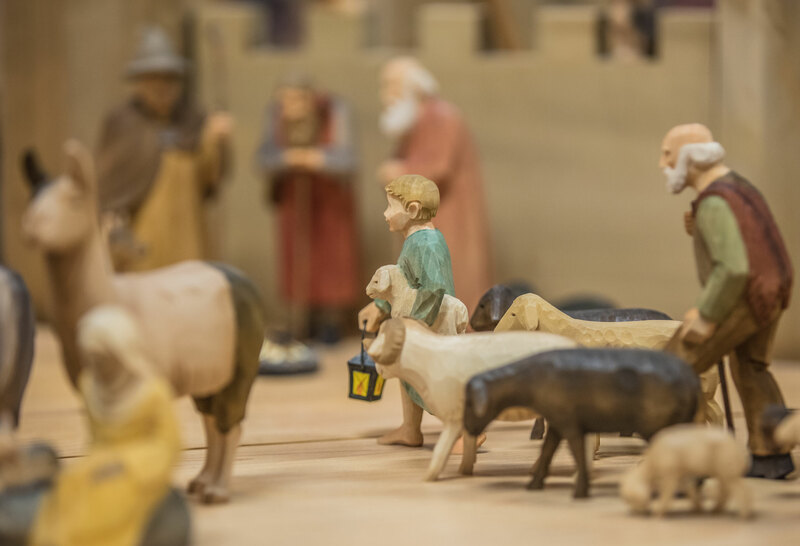 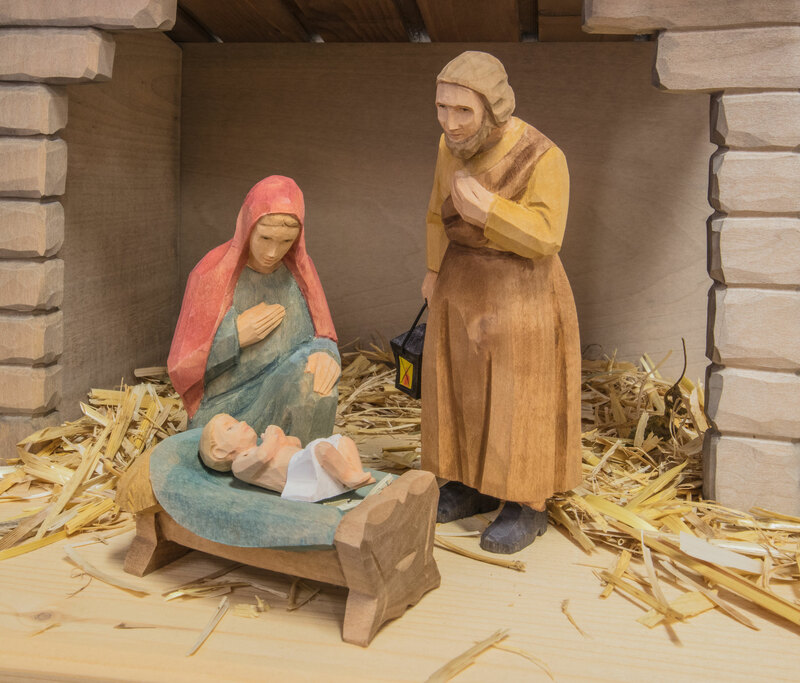 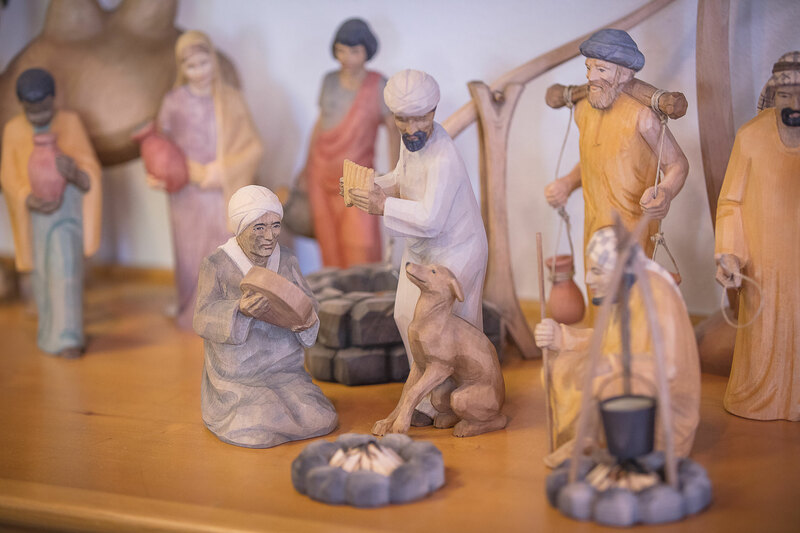 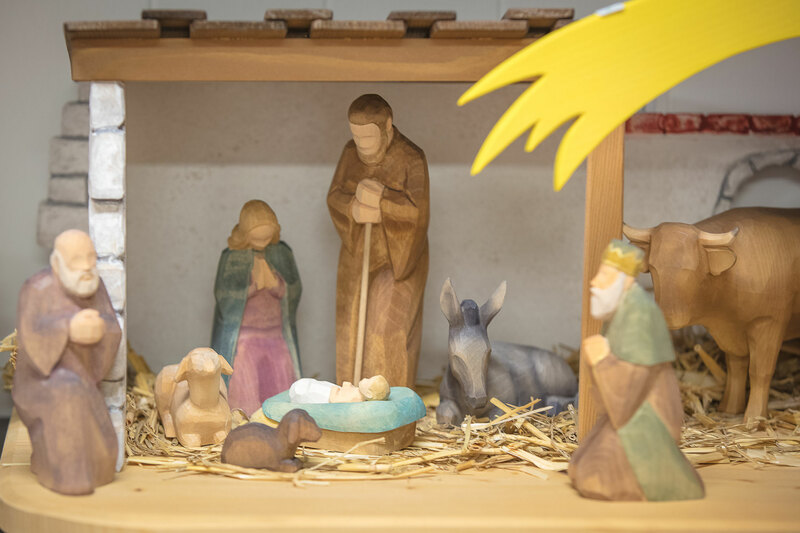 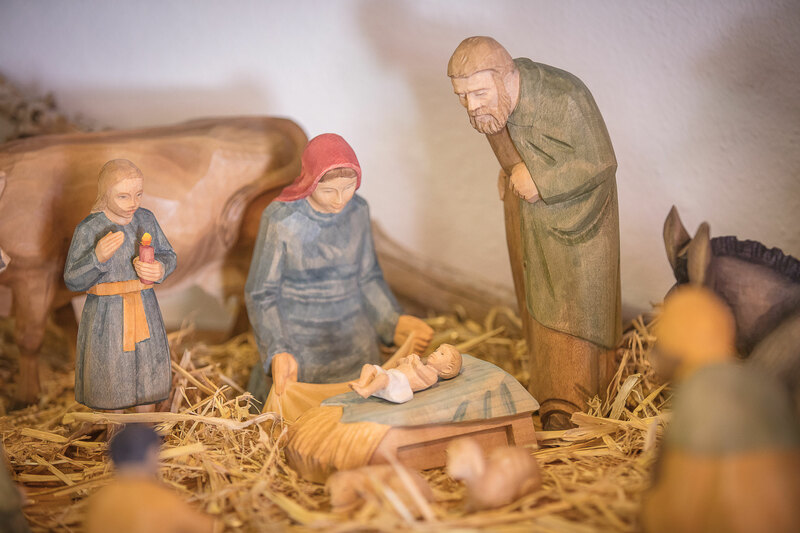 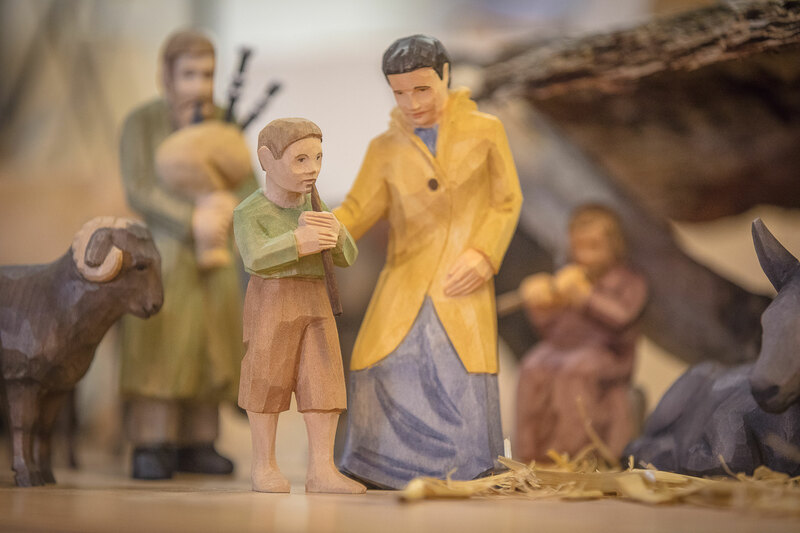 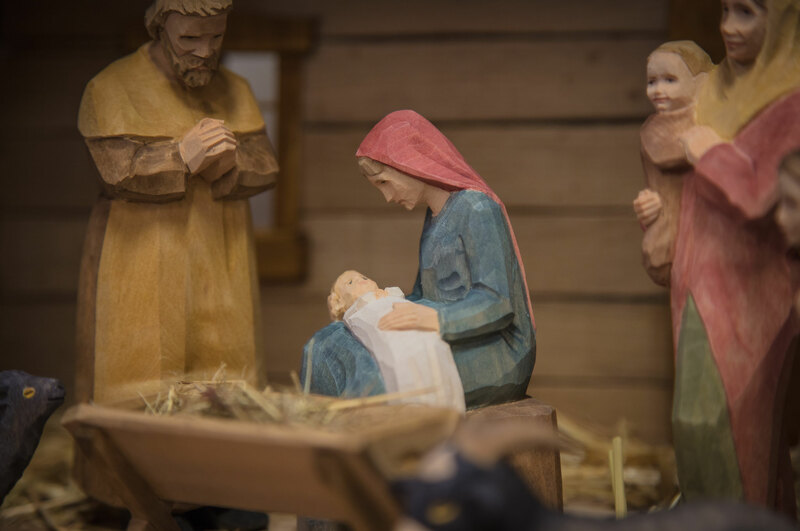 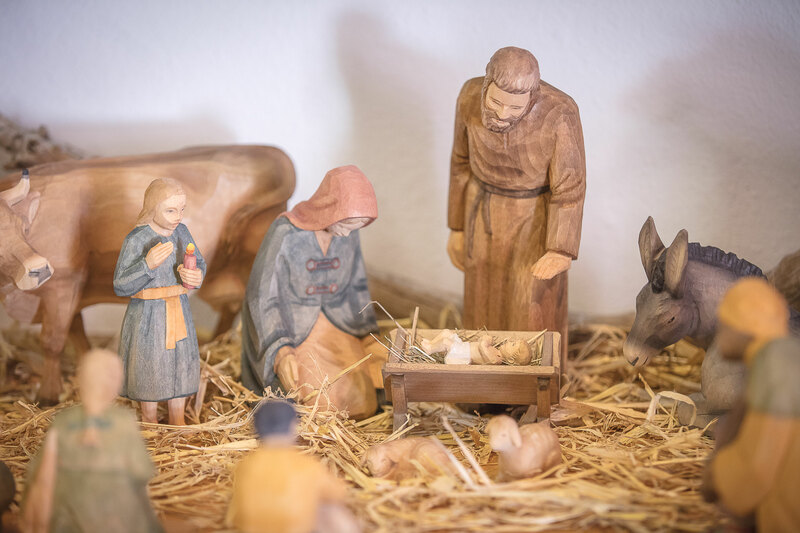 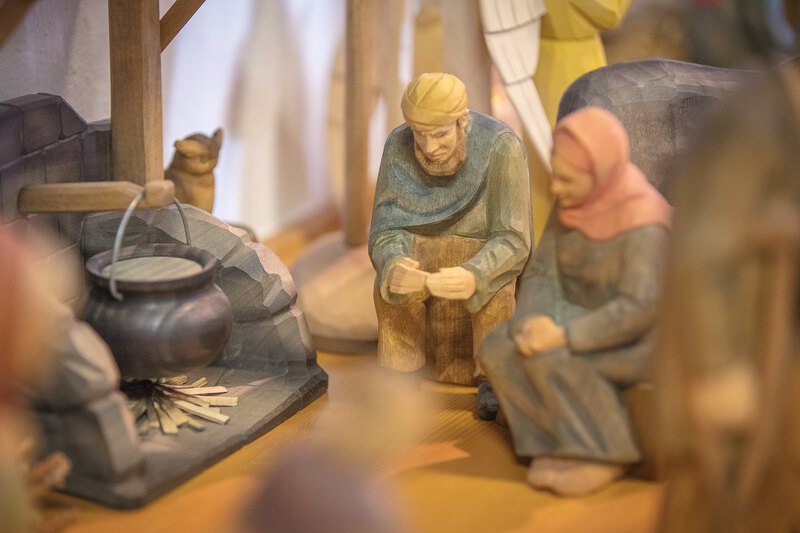 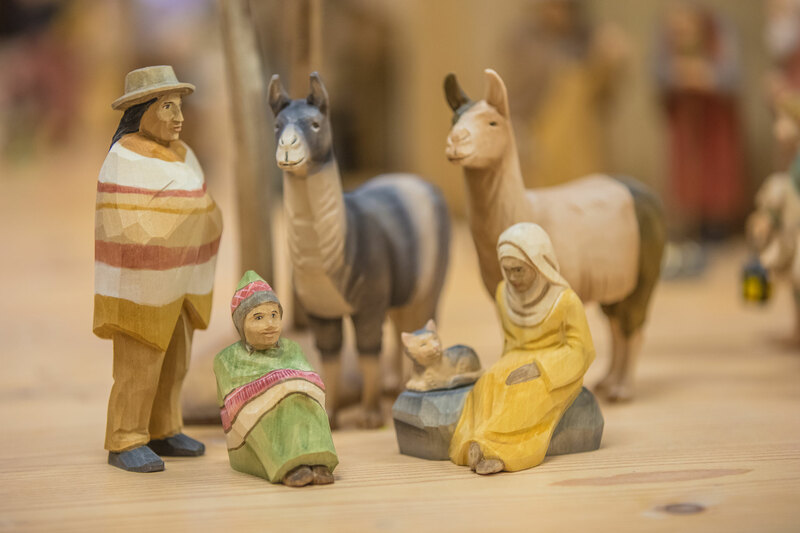 These hand-carved, stylized manger figures made out of lime Wood look stylishly modern and yet they retain the characteristic of manger figures in their original form.